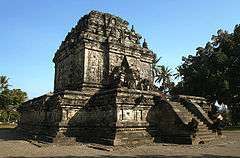 A candi (pronounced [tʃandi]) is a Hindu or Buddhist temple in Indonesia, mostly built during the zaman Hindu-Buddha or "Indianized period", between the 4th to 15th centuries. 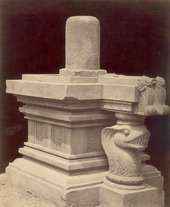 The Great Dictionary of the Indonesian Language of the Language Center defines a candi as an ancient stone building used for worship, or for storing the ashes of cremated Hindu or Buddhist kings and priests. 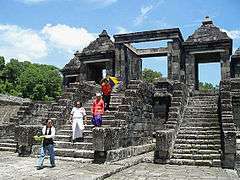 Indonesian archaeologists describe candis as sacred structures of Hindu and Buddhist heritage, used for religious rituals and ceremonies in Indonesia. 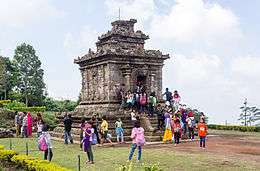 However, ancient secular structures such as gates, urban ruins, pools and bathing places are often called "candi" too, while a shrine that specifically serves as a tomb is called a "cungkup". 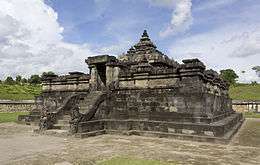 In Hindu Balinese architecture, the term candi refer to a stone or brick structure of single-celled shrine with portico, entrance and stairs, topped with pyramidal roof and located within a pura. It is often modeled after East Javanese temples, and functions as a shrine to a certain deity. To the Balinese, a candi is not necessarily ancient, since candis continue to be (re-)built within these puras, such as the reconstructed temple in Alas Purwo, Banyuwangi. 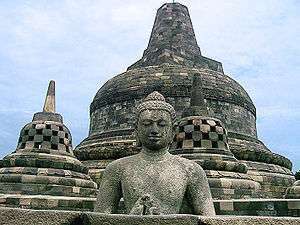 In contemporary Indonesian Buddhist perspective, candi also refers to a shrine, either ancient or new. Several contemporary viharas in Indonesia for example, contains the actual-size replica or reconstruction of famous Buddhist temples, such as the replica of Pawon and Plaosan's perwara (small) temples. 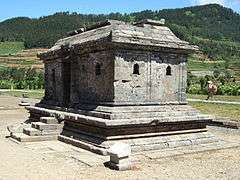 In Buddhism, the role of a candi as a shrine is sometimes interchangeable with a stupa, a domed structure to store Buddhist relics or the ashes of cremated Buddhist priests, patrons or benefactors. Borobudur, Muara Takus and Batujaya for example are actually elaborate stupas. 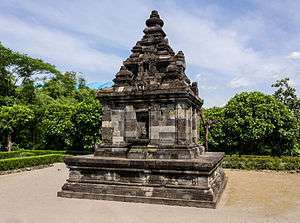 In modern Indonesian language, the term candi can be translated as "temple" or similar structure, especially of Hindu and Buddhist faiths. 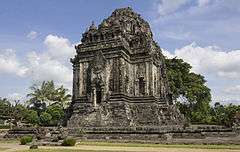 Thus temples of Cambodia (such as the Angkor Wat), Champa (Central and Southern Vietnam), Thailand, Myanmar and India are called as candi too in Indonesian. 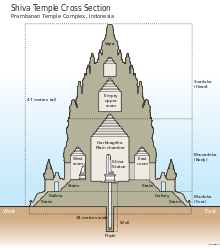 Candi refers to a structure based on the Indian type of single-celled shrine, with a pyramidal tower above it, and a portico. 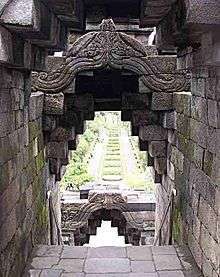 The term Candi is given as a prefix to the many temple-mountains in Indonesia, built as a representation of the Cosmic Mount Meru, an epitome of the universe. However, the term also applied to many non-religious structures dated from the same period, such as gopura (gates), petirtaan (pools) and some of habitation complexes. 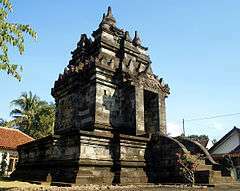 Examples of non-temple candis are the Bajang Ratu and Wringin Lawang gates of Majapahit. The Candi Tikus bathing pool in Trowulan and Jalatunda in Penanggungan slopes, as well as the remnants of non-religious habitation and urban structures such as Ratu Boko and some of Trowulan city ruins, are also considered candi. Bhurloka (in Buddhism: Kāmadhātu), the lowest realm of common mortals; humans, animals also demons. Where humans still bound by their lust, desire and unholly way of life. The outer courtyard and the foot (base) part of each temples is symbolized the realm of bhurloka. Andesite is an extrusive igneous volcanic rock, of intermediate composition, with aphanitic to porphyritic texture. The colour of this lava rock ranged from light to dark grey. Andesite is especially abundant in the volcanic island of Java, mined from a certain cliffs or stone quarry with andesite deposit formed from compressed ancient magma chamber or cool down lava spill. Each of andesite stones are custom made into blocks with interlocking technique, to construct temple walls, floors and building. Andesite stones are easily formed and carved with iron chisel, making it a suitable material for temple walls and decorations carved as bas-reliefs. 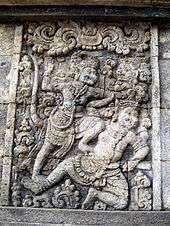 The walls of andesite stone was then carved with exquisite narrative bas-reliefs, which can be observed in many temples, especially in Borobudur and Prambanan. Andesite rocks are also used as the material for carved statues; the images of deities and Buddha. Brick is also used to construct temple. 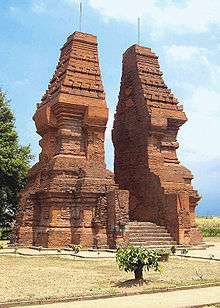 The oldest brick temple structure is Batujaya temple compound in Karawang, West Java, dated from 2nd to 12th century CE. Although brick had been used in the candi of Indonesia's classical age, it was Majapahit architects of the 14th and 15th centuries who mastered it. Making use of a vine sap and palm sugar mortar, their temples had a strong geometric quality. 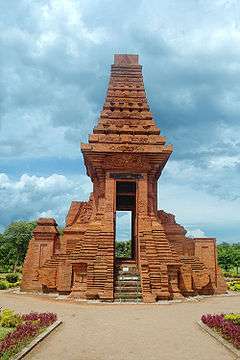 The example of Majapahit temples are Brahu temple in Trowulan, Pari in Sidoarjo, Jabung in Probolinggo. Temples of Sumatra, such as Bahal temple, Muaro Jambi, and Muara Takus are also made from bricks. However, compared to lava andesite stone, clay red bricks are less durable, especially if exposed to hot and humid tropical elements and torrential monsoon rain. As the result many of red bricks structures were crumbling down over centuries, and the reconstruction efforts requires to recast and replace the damaged structure with new block of bricks. Tuff is also a volcanic rock that is also quite abundant near Javanese volcanoes or limestone formations. In Indonesian and Javanese languages, tuff is called batu putih (white stone), which corresponds to its light color. The chalky characteristic of this stone however, has made this stone unsuitable to be carved into bas-reliefs of building ornaments. Compared to andesite, tuff is considered as an inferior quality building material. In Javanese temples, tuff usually are used as stone fillings; forming the inner structure of the temple, while the outer layer employed andesite that is a more suitable material to be carved. The tuff quarries can be found in Sewu limestone ranges near Ratu Boko hill. 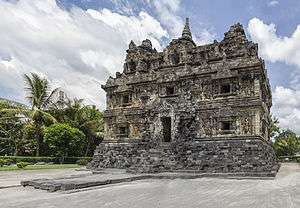 The tuff fillings in the temple can be examined in Ratu Boko crematorium temple. Tuff also used as building material of outer walls of temple compound, such as those walls found buried around Sewu and Sambisari temple. Stucco is materials similar to modern concrete, made from the mixture of sand, stone and water, and sometimes ground clamshell. The stucco as temple building material is observable in Batujaya temple compound in West Java. Wood is also believed to be used in some of candi construction, or at least as parts of temple building material. Sari and Plaosan temples for example are known to have traces stone indentions to support wooden beams and floors in its second floor, as well as traces of wooden stairs. Ratu Boko compound has building bases and stone umpak column base, which suggests that the wooden capitals once stood there to support wooden roof structure made of organic materials. Traces of holes to install wooden window railings and wooden doors are also observable in many of the perwara (complementary smaller) temples. Of course wooden materials are easily decayed in humid tropical climate, leaving no traces after centuries. 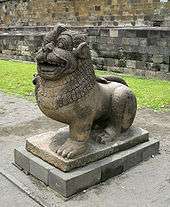 The statues of a pair of lion (Sanskrit:Siṁha, Indonesian and Javanese:Singa) flanked the portal, are often placed as the guardians in candi entrance. Lions were never native animals of Southeast Asia in recorded history. As the result the depiction of lion in ancient Southeast Asian art, especially in ancient Java and Cambodia, is far from naturalistic style as depicted in Greek or Persian art counterparts, since and all based on perception and imagination. The cultural depictions and the reverence of lion as the noble and powerful beast in Southeast Asia was influenced by Indian culture especially through Buddhist symbolism. Statue of a pair of lions often founds in temples in Southeast Asia as the gate guardian. In Borobudur Buddhist monument Central Java, Indonesia andesite stone statues of lions guarding four main entrances of Borobudur. 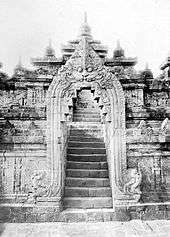 The thrones of Buddha and Boddhisattva found in Kalasan and Mendut Buddhist temples of ancient Java depicted elephant, lion, and makara. 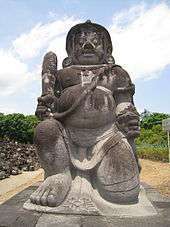 The statue of winged lion also found in Penataran temple East Java. The typical stupas in Javanese classical temple architecture is best described as those of Borobudur style; the bell-shaped stupa. The stupa in Borobudur upper round terrace of Arupadhatu consist of round lotus pedestal, gently sloped bell-shaped dome, rectangular shape on top of the dome serves as the base of hexagonal pinnacle. Each stupa is pierced by numerous decorative openings, either in the shape of rectangular or rhombus. Statues of the Buddha sit inside the pierced stupa enclosures. Borobudur was first thought more likely to have served as a stupa, instead of a temple. A stupa is intended as a shrine for the Buddha. Sometimes stupas were built only as devotional symbols of Buddhism. A temple, on the other hand, is used as a house of worship. 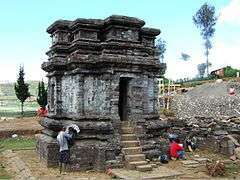 Candi Cangkuang, the only one of the few surviving West Java's Hindu temple at Leles, Garut, West Java. Located on an island in the middle of a lake covered by water lilies. Unlike other Javanese temple characteristics by grand architecture, Cangkuang temple is more modest with only one structure still standing. Shiva statue faces east toward the sunrise. Date uncertain. Candi Barong. Two almost identical temples on terraces. Believed to be 9th century Hindu and part of a sacred complex, of which they were the crown. Candi Badut. Small Shivaite temple dating from the 8th century. ↑ "Candi". KBBI (in Indonesian). ↑ Tomi Sujatmiko (9 June 2013). "Peninggalan Majapahit Yang Tersembunyi di Alas Purwo". Kedaulatan Rakyat (in Indonesian). ↑ "Replika Candi Pawon". Vihāra Jakarta Dhammacakka Jaya. ↑ Soekmono, Dr R. (1973). Pengantar Sejarah Kebudayaan Indonesia 2. Yogyakarta, Indonesia: Penerbit Kanisius. p. 81. ISBN 979-413-290-X. 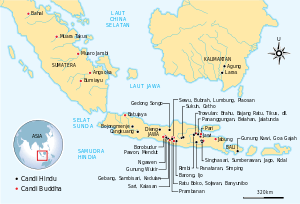 ↑ "History of Women in Buddhism - Indonesia: Part 10". Shakyadita: Awakening Buddhist Women. ↑ Soekmono, Dr R. (1973). Pengantar Sejarah Kebudayaan Indonesia 2. Yogyakarta, Indonesia: Penerbit Kanisius. p. 86. ISBN 979-413-290-X. ↑ Schoppert, P.; Damais, S. (1997). Didier Millet, ed. Java Style. Paris: Periplus Editions. pp. 33–34. ISBN 962-593-232-1. ↑ "The Greatest Sacred Buildings". Museum of World Religions, Taipei. Retrieved 4 May 2015. ↑ "Candi Gunung Wukir". Southeast Asian Kingdoms. Retrieved 22 October 2015. ↑ Cockrem, Tom (May 18, 2008). "Temple of enlightenment". Sydney Morning Herald. Retrieved 11 November 2011 – via The Buddhist Channel.tv. ↑ "Garut: The Hidden Beauty of West Java". The jakarta post. Soekmono, R. (1995). Jan Fontein, ed. The Javanese Candi: Function and Meaning, Volume 17 from Studies in Asian Art and Archaeology, Vol 17. Leiden: E.J. BRILL. ISBN 9789004102156.